G.711 Pulse Code Modulation (PCM) is a commonly used waveform for speech encoding and is suitable for use as an internet wideband audio codec in VoIP applications. Contact us to discuss your G.711 vocoder requirements. VOCAL’s G.711 codec source code is optimized for leading DSPs and RISC/CISC processors from TI, ADI, ARM, Intel and other vendors. Custom designs are available to meet specific voice codec requirements. 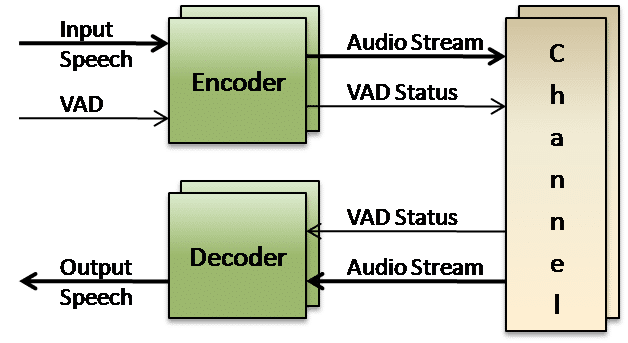 The G.711 codec may be licensed as a standalone voice compression algorithm, a library, or with a VoIP stack. The G.711 PCM codec algorithm uses a sampling rate of 8,000 samples per second, with a tolerance on that rate of 50 parts per million (ppm). Non-uniform quantization with 8 bits is used to represent each sample, resulting in a 64 kbps bit rate. There are two slightly different G.711 PCM versions; μ-law, which is used primarily in North America, and A-law, which is used by most other countries in the rest of the world. While μ-law tends to give more resolution to higher range signals, G.711 A-law provides more quantization levels at lower signal levels. When using G.711 μ-law in networks where suppression of the all 0 character signal is required, the character signal corresponding to negative input values between decision value numbers 127 and 128 should be 00000010 and the value at the decoder output is -7519. The corresponding G.711 decoder output value number is 125. ITU G.711 Appendix I outlines a Packet Loss Concealment (PLC) algorithm, also known as a frame erasure concealment algorithm. PLC can help hide transmission losses in a packetized network, specifically, in an audio system where the input signal is encoded and packetized at a transmitter first before being sent over a network where it is received at an end point, decoded and output as audio. Like G.711, many of the standard CELP-based speech coders, such as G.723.1, G.728 and G.729, also have PLC algorithms built into their standards. ITU G.711 Appendix II defines a standard method to perform Discontinuous Transmission (DTX) in a packet-based multimedia communication system. DTX utilizes the fact that a significant amount of voice traffic may not contain any speech but only background noise. This can be detected using Voice Activity Detection (VAD) and therefore fewer, smaller packets may be transmitted. Since audio is no longer transmitted in a continuous stream, Comfort Noise Generation (CNG) mimics the background silence. VOCAL’s optimized vocoder software is available for the following platforms. Please contact us for specific G.711 codec supported platforms.